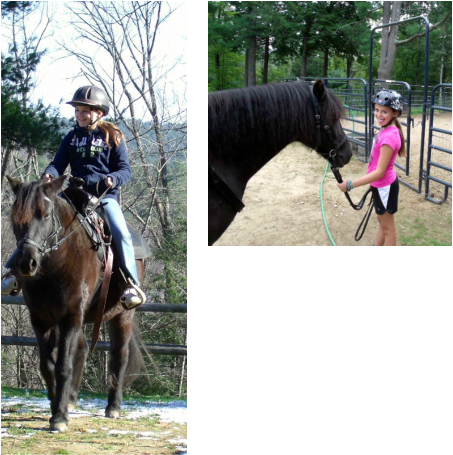 Villi Poni Farm is proud to introduce three young people who have volunteered to help out around the farm and groom our ponies and learn horsemanship. These three are some of the nicest young people we have met. They love the ponies and really enjoy doing all the work that goes along with having them. They listen and learn and have fun too!!! And on top of it all they are learning how much fun it is to ride these beautiful ponies!! This is Jasmine, the eldest of the three "Barn Kids", riding Tansy. They seem to be made for each other. Jasmine always has a smile on her face, but it gets bigger when she is with Tansy. Shauna is the comedian of the group and always has a new joke or two when she comes to the farm. She is always ready to try something new and wants to go faster and jump higher, (someday). And last, but certainly not least, is CJ. The ponies know CJ as the "cookie man". He once stuffed his pockets with peppermint horse treats and the ponies never forgot . When they see him coming they gather at the gate. He is the youngest of the group but keeps right up with the girls when it comes to riding. This is Olivia and Vincent, they are the next generation of Villi Poni Farm "Barn Kids". They are our neighbors and they have a mini-donkey and a mini-pony of their own. We look forward to the day when they are old enough to come and work with our ponies. By that time Winsome should be ready for young riders.